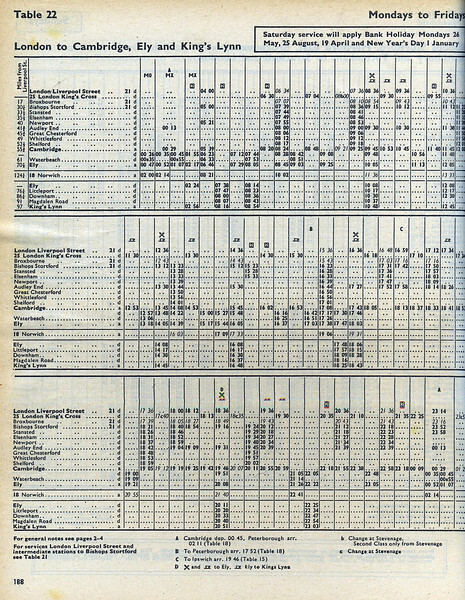 Pages from my copy of BR's 1203 page system timetable valid from May 1975 to May 1976, when I was still a student. Back in 1975 London to Kings Lynn was an infrequent, relatively slow journey from London Liverpool Street, 6 trains taking around 130 minutes for the 97 miles, a not very exciting average of 45 mph. The difference to today's Fen Line timetable is most striking. On weekdays in 2013 there are 24 trains a day from London to King's Lynn, 21 from Kings Cross and 3 from Liverpool Street, with off peak trains taking on average 95 minutes for the slightly longer route from Kings Cross (100 miles). Admittedly today's offering is a plain jane EMU rather than a buffet/restaurant car equipped loco hauled set but in all other respects the service has been transformed for the better.